We are cautious on U.S. Treasuries in the short term after the recent rally. Yet, we still advocate exposure to build portfolio resilience. March jobs growth and a slew of revised data improved the outlook for U.S. first-quarter economic activity, helping boost stocks last week. A European Central Bank meeting will be scrutinized for any comments on weak eurozone economic data and the side effects of negative rates. U.S. Treasury yields dropped sharply in March, breaking out of the tight range they had traded in early this year. Could yields head lower still, extending the rally in Treasury prices? We take a cautious short-term stance, and see recent moves as excessive. Yet, we still like U.S. Treasuries for their key role as portfolio diversifiers. Sources: BlackRock Investment Institute, with data from Bloomberg, April 2019. Notes: The chart shows the market-implied change in short-term U.S. interest rates up to Dec. 2020, as reflected by the pricing of eurodollar futures contracts. We use the Dec. 2020 contract to represent implied end-2020 rates. The implied changes are represented by the price differences between that contract and the contracts for Dec. 2018, Jan. 2019, Feb. 2019, March 2019 and April 2019 delivery, moving one contract forward each time a contract expires. We assume rate moves are 0.25 percentage points. Just one illustration of the extent of the recent rally: The 5-year U.S. Treasury yield fell to 2.25% from 2.5% over the course of March, a similar move not seen since the late-December drop in global equity markets. Yields have recovered somewhat in early April, but remain well below early-March peaks. 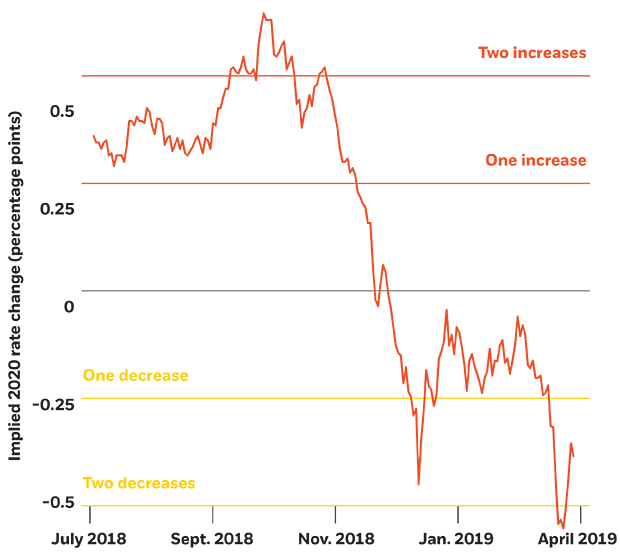 A major factor fueling the rally in Treasury prices: Market reaction to the Federal Reserve's dovish pivot this year, with the central bank indicating its rate hike pause could be an extended one. Yet, we believe market expectations of Fed policy have become too dovish. Markets have swung from pricing in two quarter-percentage-point Fed rate increases between fall 2018 through the end of 2020 to now pricing in two decreases by the end of 2020. See the line's drastic downward shift since last fall in the chart above. We still expect the Fed's next rate move to be up - just not for a while as the Fed remains on hold. The recent surprise move lower in Treasury yields also seems to have been exacerbated by technical factors. When bond yields broke sharply below their recent ranges, some investors in markets such as U.S. mortgages were prompted to buy additional U.S. Treasuries to hedge their positions. This type of buying rarely has a long-lasting impact on a market as liquid as that of U.S. Treasuries, in our view. Against this backdrop, we advocate patience before adding to U.S. Treasuries exposure, and see yields moving back into their early-2019 range (2.4-2.6% for the 5-year yield). We focus on the 5-year, as a relatively flat yield curve means the incremental yield currently offered by longer-term exposures is not worth the extra interest rate risk, in our view. Global stocks climbed, led by gains in Asia and Europe. Materials was the top-performing global sector and financials rebounded, while defensive sectors underperformed their peers. Quality was the strongest performing style factor. Markets digested better-than-expected China Purchasing Managers' Index data showing manufacturing activity expanded in March at its fastest pace in eight months. A greater-than-forecast March rebound in U.S. hiring, and upward revisions to U.S. business inventories, construction and retail sales data, implied U.S. first-quarter economic activity was more solid than previously expected. Industrial orders in Germany surprised to the downside, extending the trend in recent months of weak eurozone economic data. The British government requested a further Brexit delay. The presidents of the U.S. and China said their countries made progress on a trade deal, but they did not yet schedule a meeting (see our geopolitical risk dashboard for more on U.S.-China tensions). This week's ECB's meeting and press conference will be closely watched for any reaction from the central bank to the recent deterioration in eurozone economic data. Also warranting attention: any discussion on the effectiveness of the central bank's negative rate policy and its impact on bank profitability. Remarks from ECB President Mario Draghi in late March signaled the central bank may consider measures to mitigate the impact on the financial sector, while seeking to preserve the overall economic benefits of negative rates. Ongoing policy accommodation is warranted, in our view, and we expect the ECB to keep rates on hold until at least year end. Source: Thomson Reuters DataStream. As of April 5, 2019. European sovereigns Low yields, European political risks and the potential for a market reassessment of easy ECB policy or pessimistic euro area growth expectations all make us wary on European sovereigns, particularly peripherals. Yet, any further deterioration in U.S.-European trade tensions could push yields lower. European credit "Low for longer" ECB policy should reduce market volatility and support credit as a source of income. European bank balance sheets have improved after years of repair, underpinning fundamentals. Yet, valuations are rich after a dramatic rally. We prefer high yield credits, supported by muted issuance and strong inflows. Other Commodities and currencies * A reversal of recent oversupply is likely to underpin oil prices. Any relaxation in trade tensions could boost industrial metal prices. We are neutral on the U.S. dollar. It has perceived "safe-haven" appeal, but gains could be limited by a high valuation and a narrowing growth gap with the rest of the world.